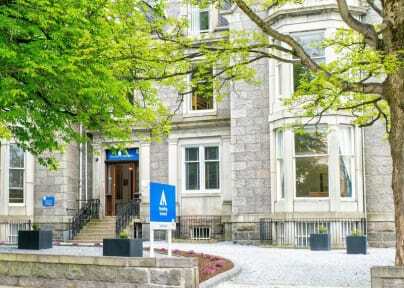 This four star VisitScotland accredited youth hostel is located in the desirable west end of Aberdeen with excellent transport links to the city centre. Refurbished in 2018 and highly commended by VisitScotland, it’s an ideal choice for leisure and business travellers alike. The hostel offers guests comfortable private en-suite rooms as well as spacious shared accommodation with private lockers for those exploring the city on a budget. Guests can opt for a continental breakfast, served daily in our café, or choose to prepare their own food in our well-equipped self-catering kitchen. The café also serves hot and cold drinks and a selection of confectionery and muffins throughout the day. Relax in the large, bright, bay-windowed lounge, which has a wood-effect stove and wall-mounted television; or in the comfortable quiet room if you’re just looking to chill, chat or read up about Aberdeen’s must-see locations. Other facilities include free WiFi, excellent laundry and drying facilities, secure bike storage and free car parking to the rear of the building. The hostel also offers meeting facilities for up to 50 with flexible catering packages available; ideal for groups and organisations looking for meeting space close to central Aberdeen. Our quieter location is a pleasant 20 minute walk along a tree-lined road to Union Street - or hop on the number 11 bus for a short journey to the city centre. It's 30 minutes by step in the city center. The hostel is great! I would go back. Ganz tolles Hostel mit sehr sehr freundlichem und hilfsbereitem Personal! Die Aufenthaltsräume sind sehr liebevoll ausgestattet und sehr modern. 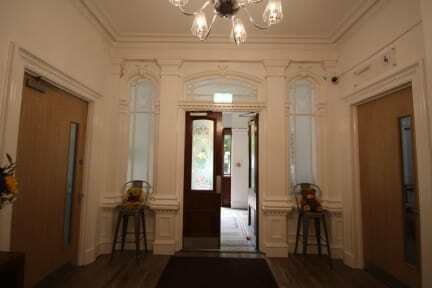 Really nice hotel like youth hostel in Aberdeen. Takes about 20 minutes by foot to get to city center. Really nice staff. Clean rooms and kitchen. Would book again. Zimmer waren super. Bäder ok. Könnten aber noch modernisiert werden. Leider kein Aufzug. Das Haus hat 4 Stockwerke. Man war auch schnell in der Innenstadt. Das Personal stand mit Tipps für die Umgebung bereit. Größe Küche war vorhanden. Very nice Hostel about 20 minutes from the city centre by foot. Everything was clean and they even had a parking spot. Sehr sauberes und gutes Hostel mit nettem Personal und geräumigen Zimmern. Ein Minuspunkt ist die Hellhörigkeit. Im Zimmer am Etageneingang waren Türgeräusche übermäßig laut zu hören und morgens ein sehr früher Wecker. Nice Hostel. Very big kitchen with all you need for cooking a nice meal. It is not that far from city, just a nice walk from town. Das einzig wirklich störende, war das grüne Notlicht in den Zimmern, das grell und leuchtend die ganze Nacht durchbrannte. Ein kleines Licht wäre ja verständlich, aber ein riesig großes Licht an der Decke, gekoppelt mit der Lampe, gab einem das Gefühl in einem "Bahnhof" zu übernachten. Das Rezeptionistin war nicht besonders freundlich und hatte offensichtlich keinen Spass, dort zu arbeiten. Schade! Es gab nur eine Dusche auf der ganzen Etage und der Duschkopf war kaputt (fiel die ganze Zeit ab) und unter den Betten wurde nie Staub gesaugt, da lagen viele blaue Konfettis. Ansonsten war es ein angenehmer Aufenthalt.